Childs Engineering has provided engineering services to AECON FABCO during the rehabilitation of a 3000 ton capacity marine railway. The railway has been strengthened in several areas such that it has the capacity to haul vessels with up to 24 ton per foot of unit loading. The railway has a side transfer system which allows for vessels to be hauled out of the water then transferred to land for extended overhaul work while allowing the railway to continue to dry dock other vessels. In addition to the structural upgrades and repairs, a new motor was installed with variable speed and torque capacity. The shipyard at Pictou has been in operation on and off since 1900 and the last upgrade rebuild of the equipment was done in the 1980’s. 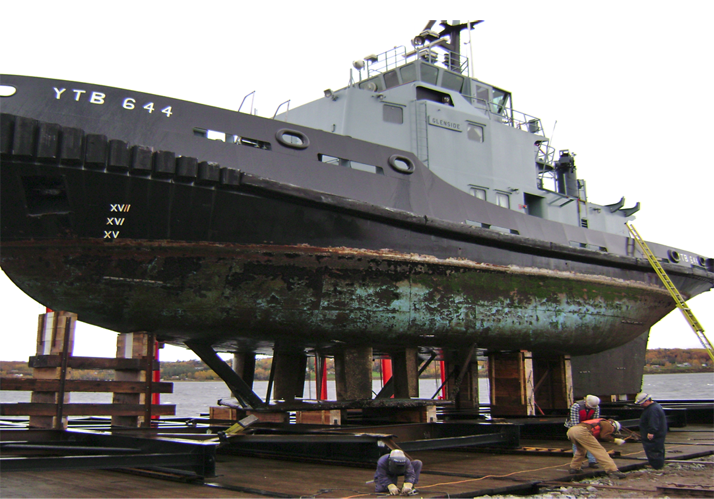 The first vessel after the rehabilitation was hauled in October 2010. Childs has been assisting the dockmaster to learn the new system and “break in” the new structure.